This guide is for smartEditor Version 2.1.6. Smart Editor is a web editor integrating both the INSPIRE metadata publication queryables for services, series, and data and the ISO 9139 metadata implementation of ISO 19115 and ISO 19119 as well. This document describes the general usage of smartEditor and shows some important metadata elements to be edited. It assumes you followed the installation instructions. After typing http://[host]/smartEditor into your browser the application welcomes you with the main start page. 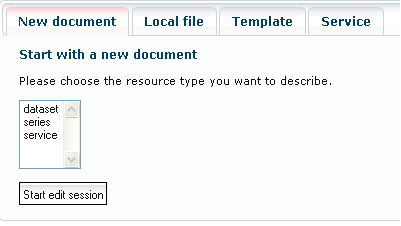 Use the New Document function to open a new metadata document. It is possible to create metadata entries for datasets, series, and services. Select a resource type and start editing with a new document. The available metadata elements in the editor are depending on the choice of resource. It is possible to open a previously created metadata document with the Smart Editor and to continue editing it. Select the locally available XML file and start the editor. If necessary you can use a stylesheet from the list to transform the metadata into INSPIRE compliant metadata. If the XML-file is a compliant metadata document, no stylesheet is required. It is possible to create and save metadata templates for use with the Smart Editor. All templates that are available for use will be displayed in a list. Select a template from the list to open the editor, or highlight a template and delete it. Note: New templates are created in the editor environment. Run Smart Editor and enter all the parameters for your template. 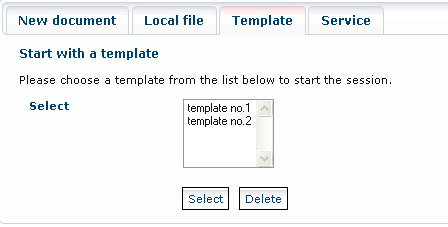 Then select “Create Template”. The title of the metadata is used as the name of the template. Tip: Templates have the advantage that input values can be pre-defined, which means that you can suggest values, such as contact data. This minimises the work involved in collecting metadata. Using Smart Editor, it is a simple matter to record service metadata of INSPIRE services. Enter the URL of the service and start Smart Editor. After Smart Editor has been opened, it is possible to begin entering the metadata into the user screen. The metadata elements have a similar structure to the detailed metadata view. In addition, seven basic functions are made available above the tabulators. You have completed the process of recording a metadata entry and wish to publish it. Click Publish and select the protection level (visibility status) for publishing. This function is also used for determining the validation state. If the metadata entry is valid, the Select Status dialogue is displayed. This function is for exporting all the current entries from the user screen into an XML file, which is then saved locally. Click on this icon to create or update a template. The current status (filling rate) is adopted by the template. The name of the template corresponds with the title of the metadata. Note: Please do not use any special characters in template titles. The current work status is saved as a draft. This can be completed, updated and published at a later date. Note 1: It is not necessary for a draft to be valid, but at least one metadata title needs to be entered. This corresponds with the name of the draft in the Start with Draft list. Note 2: A draft is only visible to the person who created it. 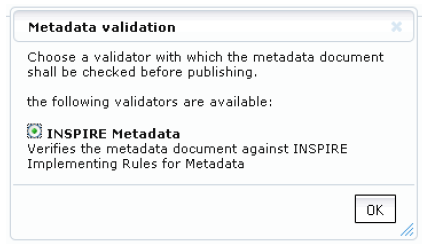 Important note: For validation click on Publish to query the current validation state of the metadata entries. The validation reports are displayed above the tabbed display. Show startup page of smartEditor: this exits the metadata recording screen. changes will be lost if you close the editor. description and the ISO element name. Initially, a few metadata elements may be either filled or empty, as determined by the administrator. To collect new metadata elements, click on the respective symbol. The interface is reloaded and a new input tab is displayed for that metadata element. To delete an element, highlight the desired entry and click on the symbol. The purpose of the tool symbol is to provide support in entering data. 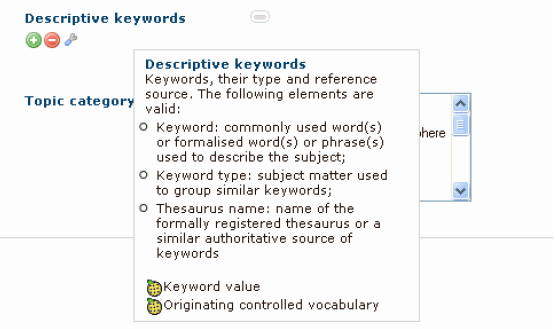 A relevant input help is displayed, depending on the metadata element; for the hierarchy level this can be the category tree, for keywords it can be the GEMET browser, or for primary metadata, a search window. Record the metadata elements used in the description of the geo-resource. You can display tooltips for any metadata element. Hold down the Alt key and move the mouse cursor onto the element name. 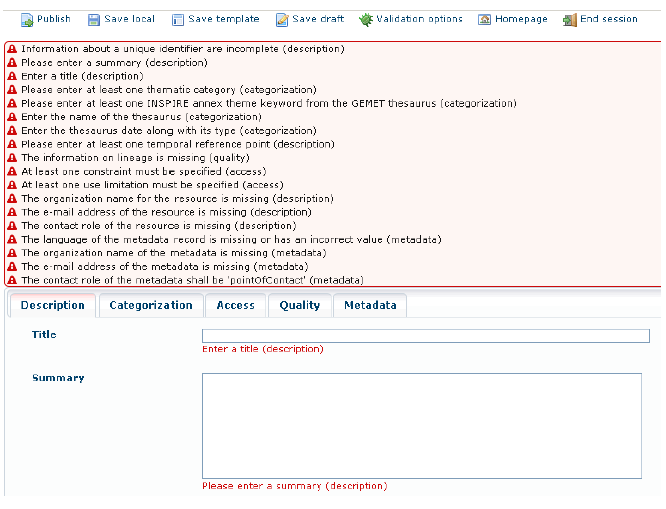 Record the metadata elements used for the thematic or hierarchical categorisation of the geo-resource. Record the information for accessing the resource. Record quality information for the resource and INSPIRE conformity information. Record the descriptive information for this metadata entry. Note that the user screens for recording service metadata have fewer parameters. However they also have a number of additional metadata elements. Select the service type for the resource from the list. Note: Services have different operations defined. The standard one is the operation of requesting the service capabilities. For some service types the operation is given above. Linking to a service with datasets: To link a dataset to a service, an element must be generated for each dataset under ‘Access > Coupled resource’. Enter an operation name (as in the Service Operations illustration) plus the name of the Layer or FeatureType (if available). The identifier is defined using a dialog for a separate search. Click on the Tool icon to search for a dataset. If an identifier has been created as defined previously for dataset descriptions, the latter can be linked to here. The ‘Show coupled service’ icon is displayed in the hit list.